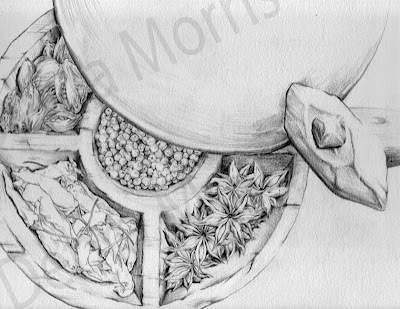 The prompt today was draw a bottle/ jar of herbs or spices, but rules are meant to be broken/bent a little, aren't they? I've been looking for an excuse to draw this Indian spice box for many years. As tomorrow is draw something hot, it has the dried chilli peppers.... I'll be painting them if I have time.